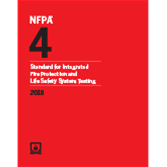 NFPA 4, Standard for Integrated Fire Protection and Life Safety System Testing outlines specific test scenarios to confirm the operation, interaction, and coordination of multiple individual systems perform their intended function. Invaluable to facility managers, the insurance industry and the Integrated Testing Agent (ITa) as well as other stakeholders in the testing process, NFPA 4, Standard for Integrated Fire Protection and Life Safety System Testing provides the minimum requirements for integrated testing and documentation prior to building occupancy and during a building's lifecycle. Help ensure that integrated fire protection and life safety systems operate as intended with NFPA 4's testing scenario requirements for both new and existing systems. Built around requirements formerly located in NFPA 3's Chapter 7, Integrated System Testing, NFPA 4 includes the protocol for testing procedures, responsibilities of team members, methods, and documentation for verifying the operational readiness and sequence of integrated systems. While the Standard does not mandate integrated testing, it provides minimum requirements for integrated testing where such testing is required by another code, standard, or design document or by an AHJ. The Standard does not address testing protocol, procedures, or frequencies for individual systems. NFPA 4 backs up NFPA 3 with comprehensive and detailed provisions for fieldwork. Interested in other editions of NFPA 4? Use the drop down menu above to select the edition year you need. 4.2 Integrated System Testing Team. 6.2 Initial Integrated Systems Test. 6.3 Periodic Integrated Systems Testing. 7.2 Minimum Required Test Documentation. 7.4 Record Retention and Record Maintenance. NFPA 4: Standard for Integrated Fire Protection and Life Safety System Testing works with NFPA 3 for systematic testing and documentation of the communication between systems. New NFPA 4: Standard for Integrated Fire Protection and Life Safety System Testing provides the minimum requirements for integrated testing and documentation prior to building occupancy and during a building's lifecycle. Developed to work hand-in-hand with NFPA 3: Recommended Practice for Commissioning of Fire Protection and Life Safety Systems, this new Standard is invaluable to the Integrated Testing Agent (ITa) as well as other stakeholders in the testing process. NFPA 4 provides testing requirements for both new and existing systems to ensure that integrated fire protection and life safety systems operate as intended. Built around requirements formerly located in NFPA 3's Chapter 7, Integrated System Testing, this first-time NFPA® Standard includes the protocol for testing procedures, responsibilities of team members, methods, and documentation for verifying the operational readiness and sequence of integrated systems. While the Standard does not mandate integrated testing, it provides minimum requirements for integrated testing where such testing is required by another code, standard, or design document or by an AHJ. The Standard does not address testing protocol, procedures, or frequencies for individual systems.